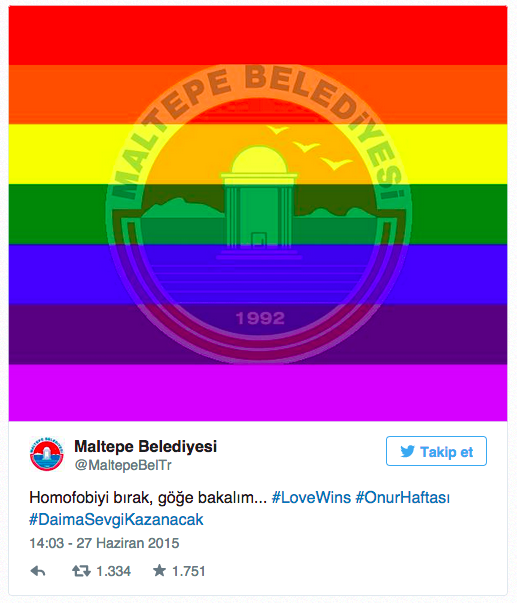 Municipalities covered their social media accounts in rainbows during LGBTI Pride Week. With the legalization of gay marriage in all states in the US, rainbow shares on social media rose. For the first time ever, Turkey’s municipalities- all of them from the Republican People’s Party- provided services for the pride parade. Çankaya municipality provided a bus to transport pride parade participants from Ankara to Istanbul. 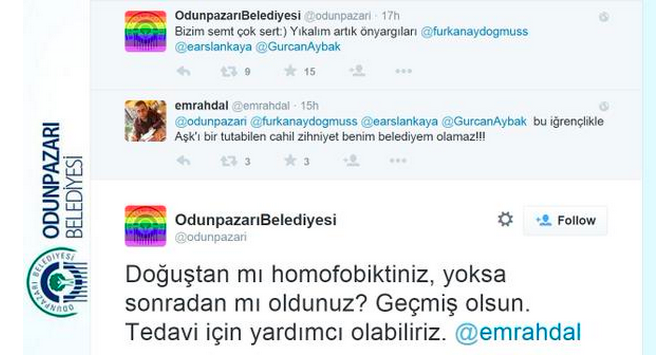 Beşkitaş municipality provided the 60 meter rainbow flag for pride parade. Şişli municipality covered production and printing costs for brochures and posters. Beşiktaş Municipality organized a reception for LGBTI pride week on Saturday, 27 June. Mayor Murat Hazinedar supported [and spoke at] the reception, which was organized by Beşiktaş Municipal Assembly member and LGBTI activist Sedef Çakmak. 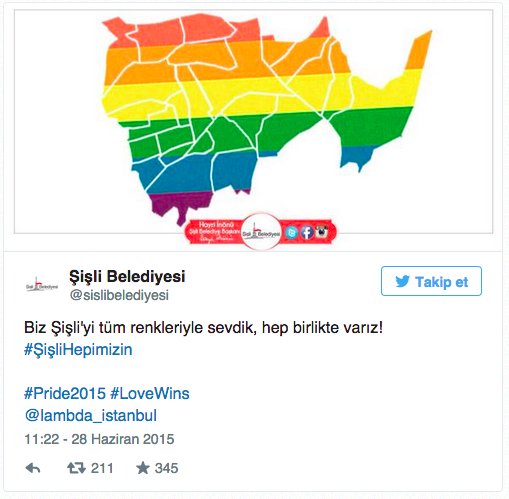 Şişli Municipality [in Istanbul] shared a Şişli rainbow map and tweeted “We always love Şişli with all its colors, we all exist together!” while mentioning Lambdaistanbul. Şişli municipality also hosted the Genetically Modified Tomato Awards. Edremit Municipality [in Balıkesir] tweeted “nobody can interfere with everybody’s life” referring to CHP leader Kılıçdaroğlu’s responses on Ekşi Sözlük prior to the elections. 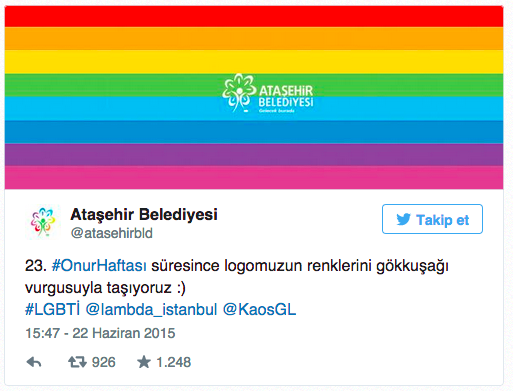 Ataşehir Municipality [in Istanbul] tweeted “We carry our logo with the rainbow emphasis throughout the 23rd Pride Week” and mentioned KaosGL and Lambdaistanbul. 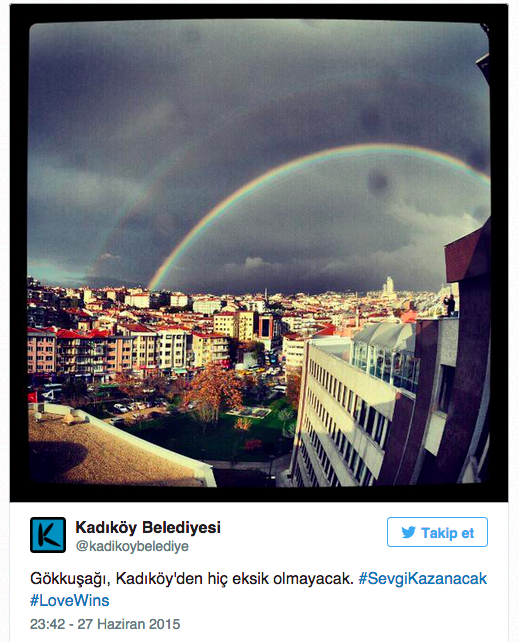 Aydın Metropolitan Municipality [in Western Turkey] tweeted “Each color is beautiful. None of them can ask the other ‘why are you different?’… It shouldn’t ask :)” and emphasized individual freedoms. 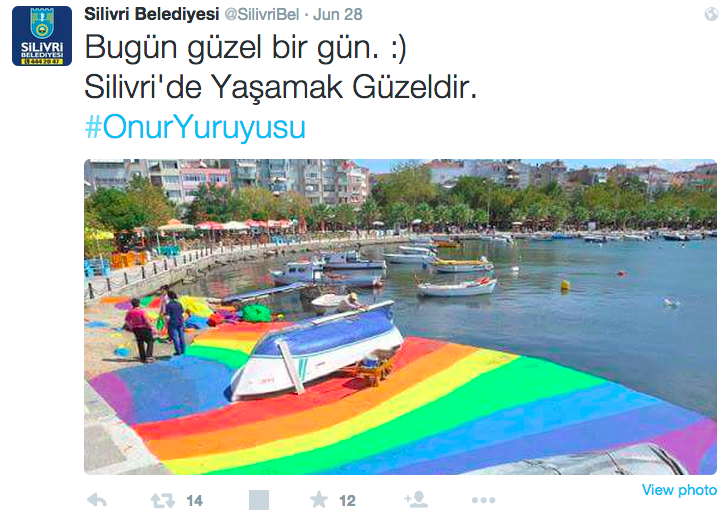 Silivri Municipality [in Istanbul] emphasized the importance of unity by sharing both Ramadan and Pride Parade events and tweeting “Today is a beautiful day 🙂 It’s beautiful to live in Silivri”.